This is the second volume of Melvin J. Lasky's The Language of Journalism series, praised as a "brilliant" and "original" study in communications and contemporary language, and as "a joy to read." When it was first published, it broke ground in focusing on the comparative styles and prejudices of mainstream American and British newspapers, and in its trenchant analysis of their systematic debasement of language in the face of obligatory platitudes and compulsory euphemisms. Lasky documents the growing crisis affecting honest, thoughtful, and independent journalism in the Western world. He extends the scope of his first volume in the trilogy and deepens the interpretation. He also adds a personal touch of wit and anecdote, as one might expect from an experienced international journalist and historian. Lasky's examination of the use of formerly forbidden language is a triumph of sinuous semantics. In his incisive analysis, we see the tortuous struggle of a once Puritanized literary culture writhing to break free of censorship and self-censorship. 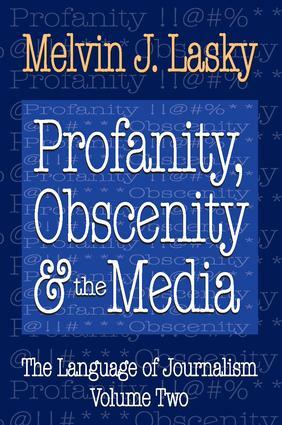 This volume on the phenomenon of profanity adds another dimension to Lasky's thesis on mass culture's trivialization of real social and political phenomena. It also underscores our society's embrace of banality, in standardizing politically correct jargon and slang. Readers of the first volume will find here a new range of references to illuminate the detail of what our newspapers have been publishing. Who’s Afraid of the Big, Bad F-Word?